Find your bed the easy way with matching frame and mattresses. Naturally grown on sustainable plantations. Non-toxic, breathable, durable and incredibly supportive. Perfect for healthy mattresses. Southdown free ranging sheep. Organically grown and processed. Carded and quilted into thick breathable layers. Northland grown macrocarpa and pine. Exceptional reliability. Our range of natural mattresses and frames have been improved and refined over thirty years. They range from very soft to very firm densites, with varied support levels and feels. Everyone has mattress preferences but it can be difficult to find the perfect fit. Our Seraphic organic latex mattress range is amazingly adaptable, you can choose the feel of each latex layer inside. Change layers to customise the support, depth and overall feel, even after purchase. 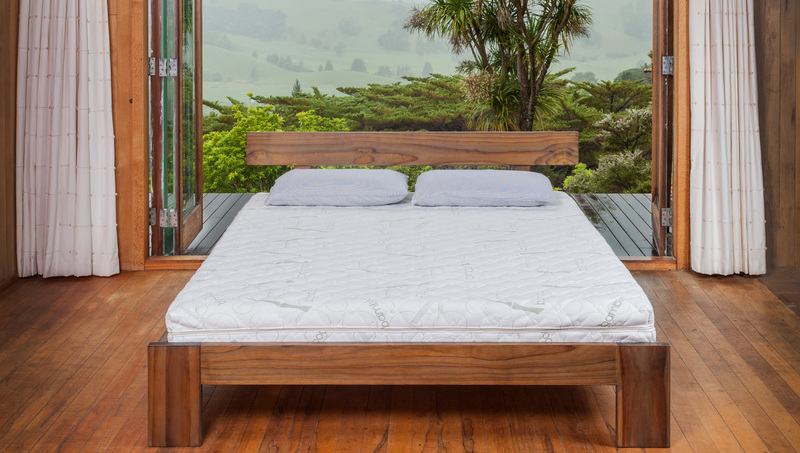 New Zealand designed and produced; we craft all the latex mattresses and timber frames in our West Auckland workshop. Do you have a specific mattress feel, size or design in mind? Do you need a certain size of frame? Tell us your requirements and what feel of bed you like best, and we'll give you an honest opinion on whether we can make it for you. We quote prices based on materials and crafting time, we don't surcharge for special orders, and we're exceptionally good value. Personalise a Seraphic mattress to suit your preferences, special order a custom design or size, or simply choose a size and feel from our recommendations: Natural Beds can make and deliver your personally ideal bed. We have generous guarantees and warranties for all our products. How do you know which bed to order? We hope this website will help explain things, and you are always welcome to phone or email us for more details and advice - not a hard sell. You'll reach someone with years of hands on experience making natural beds, who sleeps on their own ideal bed, and who genuinely wants to make the best possible bed suited for you. You can depend on us for useful trail, exchange, refund services. Our Seraphic mattress service continues even after you have bought your mattress! Our mission is to create your ideal bed. We understand that after a night's sleep you may wish your new bed was firmer or softer. We support this with our unique, and genuinely helpful after-sale services. You can expect complete sleep satisfaction when you buy from Natural Beds. We love praise and suggestions. You can read how other people feel about their natural bed on our testimonial page. Please contact us with your questions, and if you buy from Natural Beds, we'd love your feedback too. Rest easy knowing your Natural Bed is healthy, comfortable and will last for years. The natural approach to bed design, materials and construction in our Oratia Bed Workshop.